With equities settling significantly higher, +25pts @ sp'2093, the VIX was in cooling mode, -13.8% @ 13.44. Near term outlook is for renewed equity weakness to the sp'2050s, which should equate to VIX 17/18s. A pretty major daily decline for the VIX. *I am long VIX from 14.15... having exited the previous day from 16.10. I am seeking to be broadly long VIX into Sept/early Oct. US equities closed significantly higher, sp +25pts @ 2093. The two leaders - Trans/R2K, settled higher by 2.7% and 0.8% respectively. 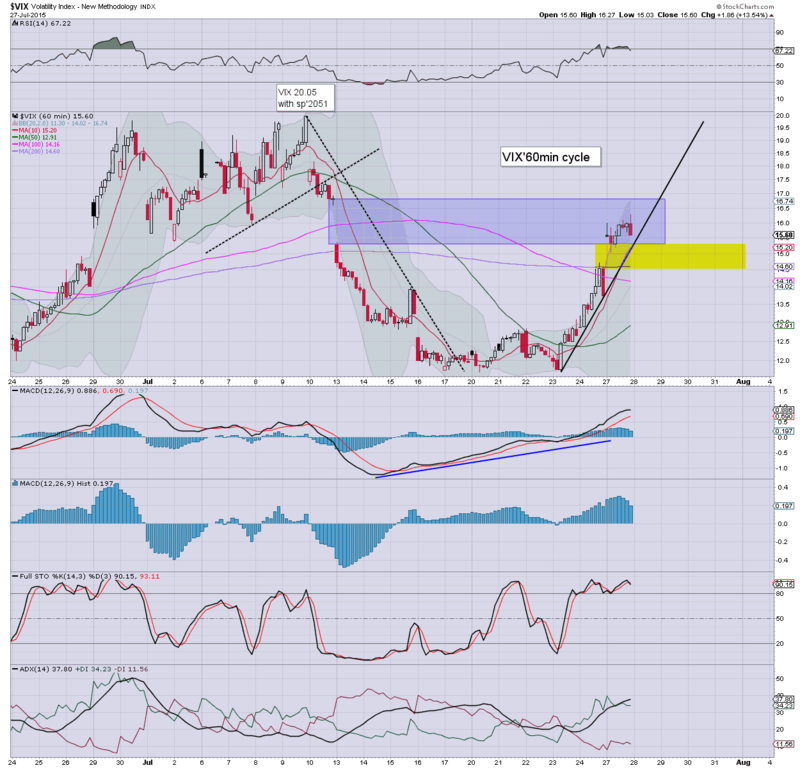 Near term outlook is for renewed weakness... once the FOMC is out of the way... with a move to the sp'2050s... and VIX 17/18s. 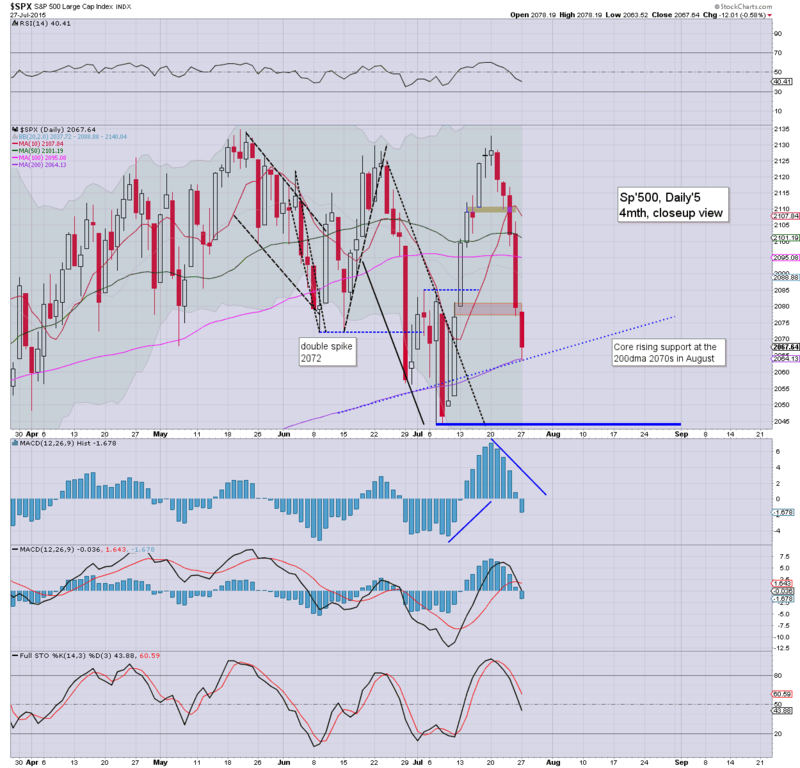 So, the 5 day run to the downside concludes with a rather strong net daily gain into the sp'2090s. Yet.. a bounce is likely all that today was. We have the FOMC tomorrow afternoon at 2pm... but once that is out of the way, the equity bears should regain control... and push the market lower into end month. *I hold VIX-long overnight from the low 14s. Seeking an exit in the 17/18s. After five (ohh the humanity!) 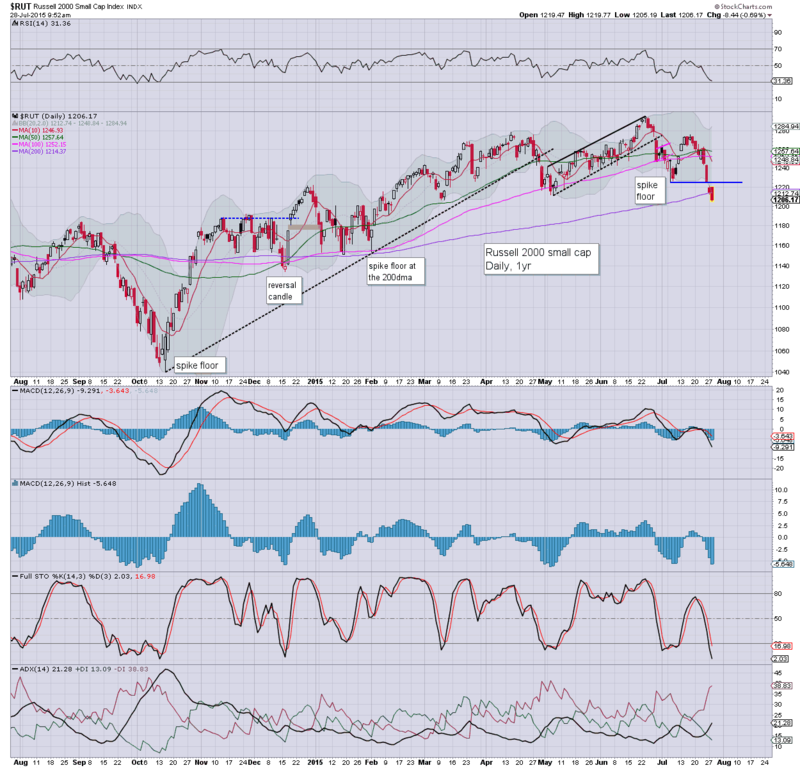 consecutive net daily declines, the sp'500 is set for a significant net daily gain... somewhere in the 2085/95 zone. 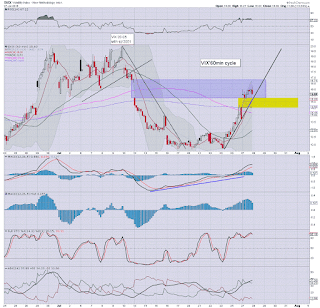 Sustained price action above the 2100 threshold looks overly difficult, and considering the bigger weekly/monthly cycles... renewed weakness into end month looks probable. *note the upper bollinger on the hourly cycle... that was always a 'worse case' for those shorting during today. All things considered though, today is likely just a bounce.. within a broader down trend. *TWTR earnings at the close.... it will make for some entertainment. Something to look for, user numbers.. which TWTR is going to struggle to increase. 2pm update - did it stop yet? 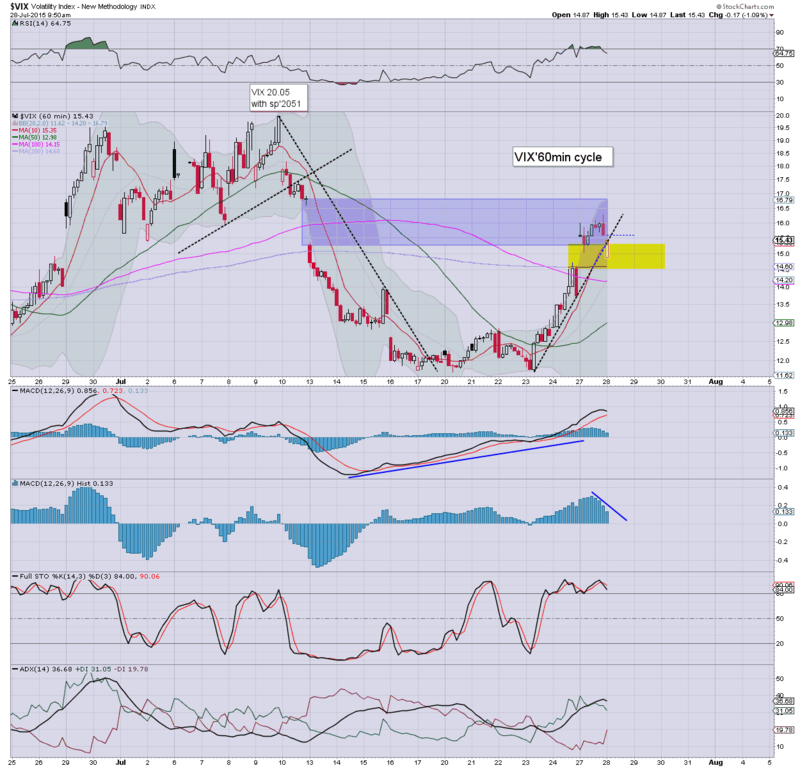 US equities have continued to grind higher, to sp'2091... a mere 2.2% away from breaking a new historic high! It remains somewhat bizarre how many continue to get so twitchy on even a moderate decline of 3-4%. VIX is surely close to a near term floor in the mid 13s... having cooled from the low 16s. Well, it is the 2pm hour... typically when Mr Market will max out. The micro 5/15/60min cycles are all on the high side now.. and we're set for some equity cooling into the close. Personally, I just can't see sustained price action back in the sp'2100s.... but hey... we'll find out soon enough, not least with a Fed day tomorrow.. and first reading of Q2 GDP on Thursday. Also.. since Friday is end of month, we'll have some of the usual 'end month' issues. *Naturally, yours truly was a few hours early... and I remain long VIX.. from the low 14s. A break into the sp'2050s.. whether later this week.. or next.. should easily result in VIX 17/18s.. and for me.. that'll be more than sufficient to have justified another VIX-long trade. 1pm update - equity bounce maxed out? 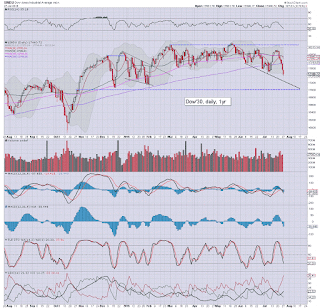 The sp'500 has bounced from an early low of 2069 to 2087, along with VIX @ 13.80. 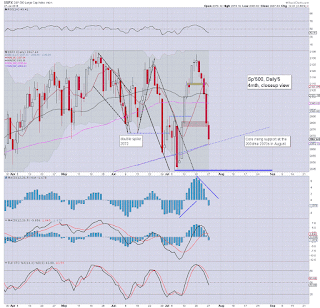 Regardless of the exact close, today is likely a mere bounce day.. with lower equity lows by the monthly close. 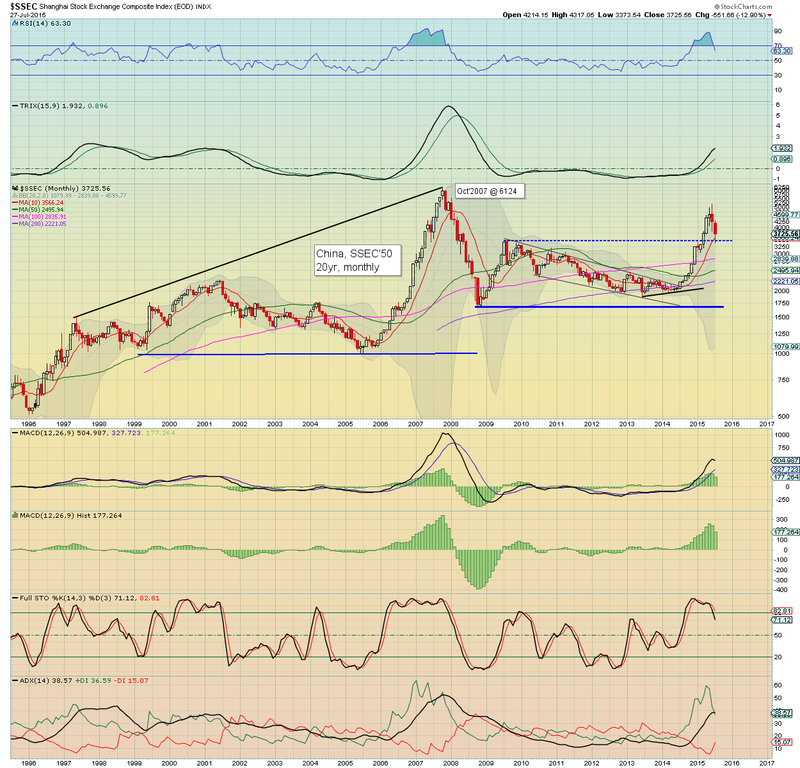 USD is holding moderate gains of 0.2% in the DXY 96.70s. 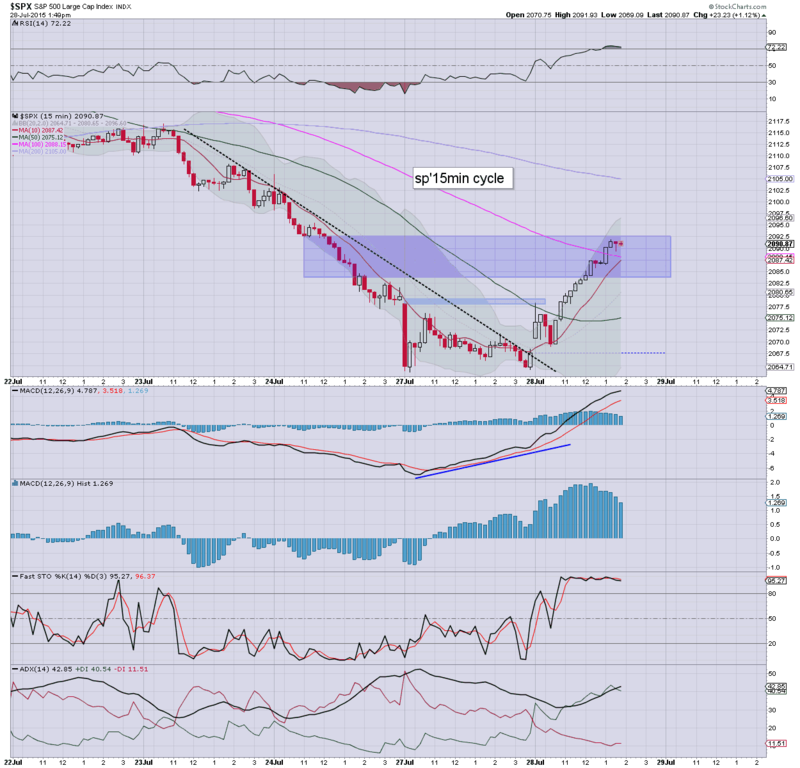 Gold is u/c, whilst Oil +2.0% in the $48s. 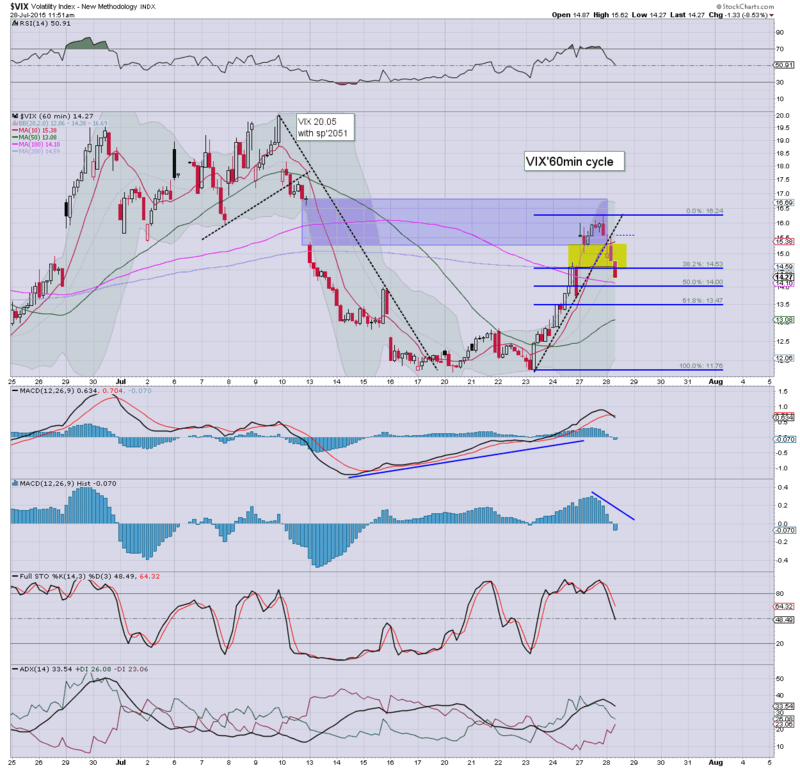 *I am long VIX from 14.15.. with sp'2086. Clearly.. a little early.. but still... its lower than my 14.50 target from yesterday.. and I'm content with things. Now its a case of whether we see those sp'2050s.. with VIX 17/18s before month end. The bull maniacs are set for a net daily gain... but there really doesn't seem to be anything sustainable about this up wave. 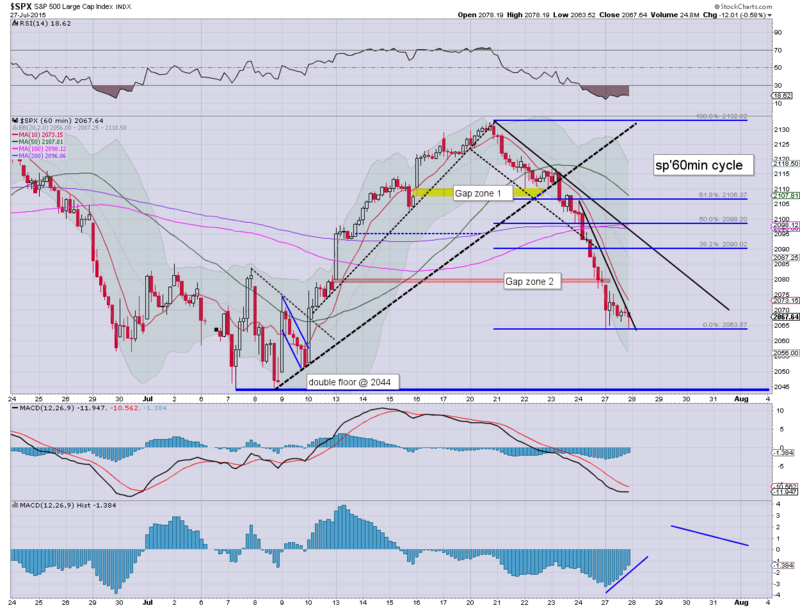 It won't take much to rattle the market and break new cycle lows.. whether late tomorrow or Thursday. 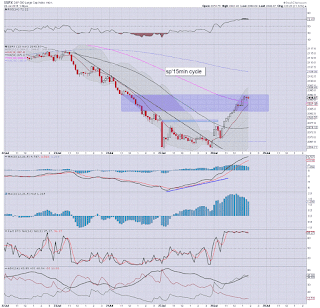 notable weakness: BABA -1.3% @ $80. If there is main market upset into Sept/Oct... BABA will vulnerable to returning back to the IPO level of $68. Mr Ma is probably more than concerned about that. 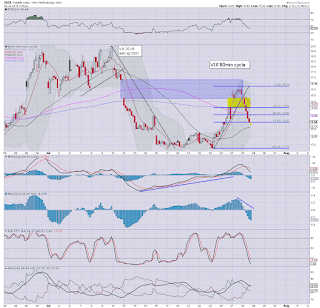 strength: INTC +1.8%.. but still.... only in the $28s... and seemingly headed for the low 20s. US equities are battling higher, with a target zone of 2085/90, and VIX set for the 14.25/14.00 zone. The Tuesday low of sp'2063 sure doesn't feel like a multi-day/week cycle floor, and there seems high probability of lower levels before the monthly close. *I remain on standby to pick up another VIX-long position.. anything in the low 14s is arguably 'fine', not least after having exited from 16.10 yesterday afternoon. Typically, I'd like to wait until the 2pm hour. Broadly, it shall remain the case that I'll want to be long VIX into early October... but I will trade in/out... to cash some profits.. when it seems wise. This morning, the cheerleaders on clown finance TV sure did seem particularly concerned about a possible sixth consecutive net daily decline. All things considered, we do look set for a net daily gain... but the sp'2050s do look due to end the week/month. Indeed... any monthly close under the 10MA (currently @ 2065) will be VERY important... but more on that issue later today. Its getting real tempting at these levels. 12.14pm.. 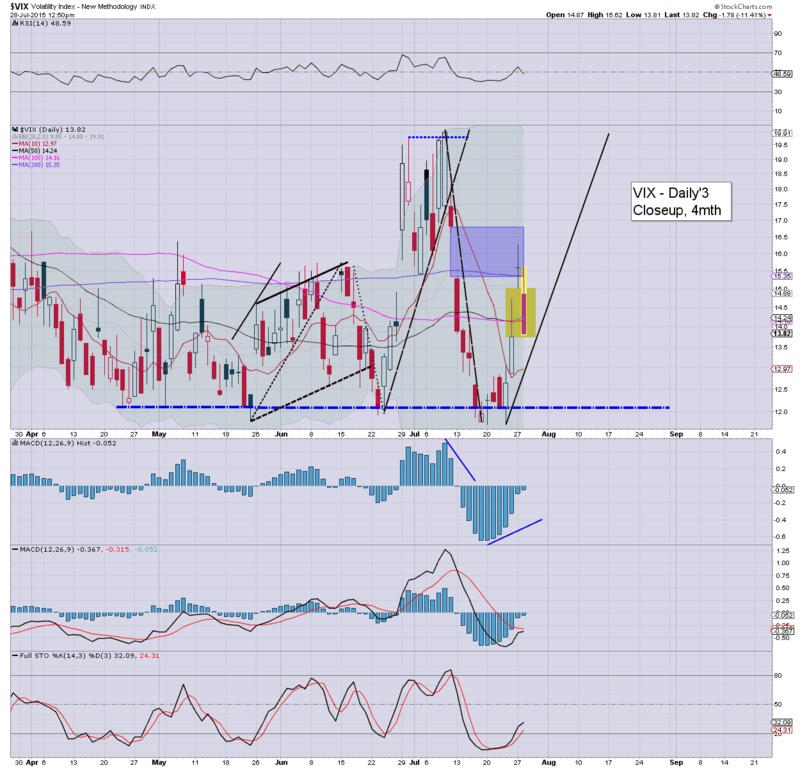 I am LONG VIX from 14.15... with sp'2084. All things considered, that seems a reasonable level. 12.22pm... .. and VIX promptly drops into the upper 13s. with sp'2086. Oh well.... I ain't gonna worry. notable strength: Oil +2.3% in the $48s... a one day bounce... in a broader down trend? US equities remain moderately choppy... trying to hold a floor of sp'2069, with VIX peaking at 15.62. Price structure is offering a slow upward battle to the sp'2085/90 zone.. along with VIX 14.50... and that might well take us into the FOMC annoucement tomorrow afternoon. We've seen this kind of nonsense many times before. Bears get teased in the morning... but there just isn't any downside power right now.. and we're set to battle upward into the mid afternoon. I think it remains a case of 'lets see where we are in the 2pm hour'. 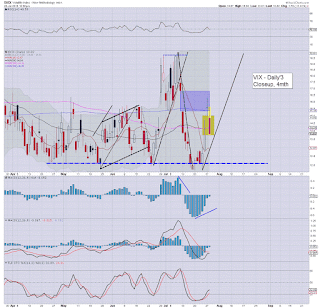 *I continue to seek a new VIX long from the mid 14s... for now.. there seems no hurry. I would refer anyone to the following.. and suggest they stare at it for a good 20 minutes. 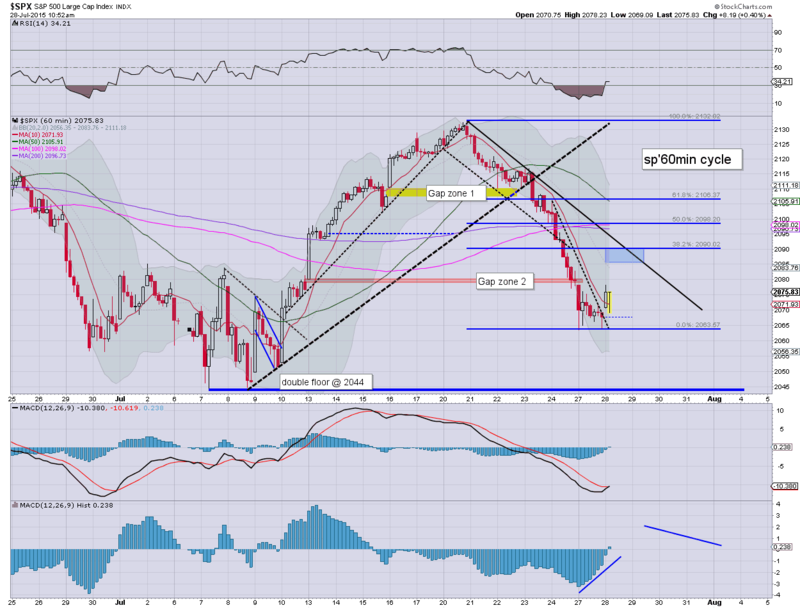 A few more hours.... 14.00 with 2085/90... seems a given. 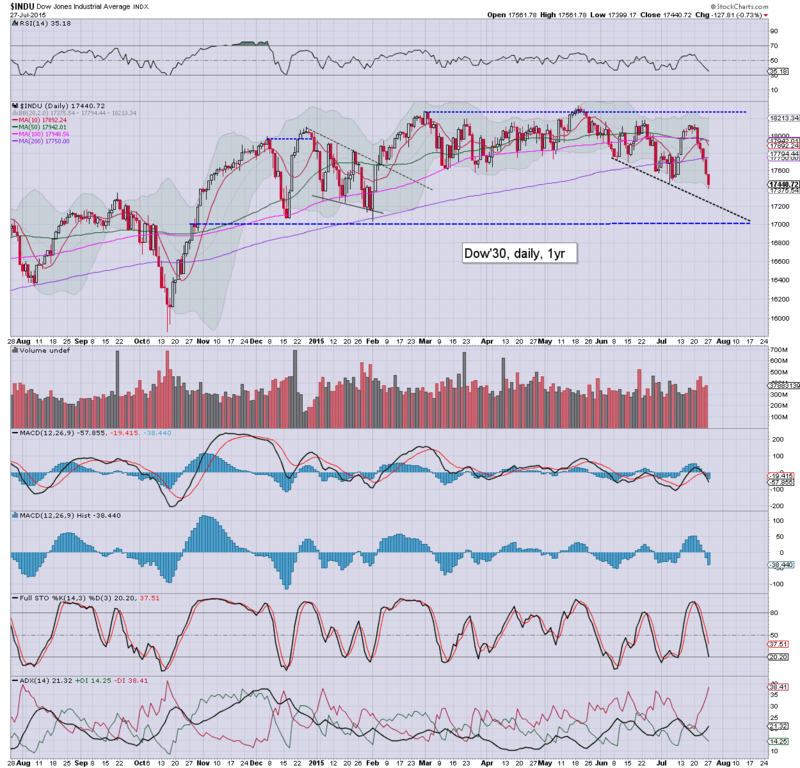 US equities open moderately higher, but the gains sure look shaky, with the Nasdaq comp' and R2K already turning red. The hourly equity cycle is threatening upward grind across today, with a viable target of sp'2085/90 zone.. along with VIX in the mid/low 14s. *I'm on the sidelines. and remain seeking to pick up another VIX-long block... but considering price structure... I'm in no hurry.. not least with the FOMC tomorrow afternoon. For now.... watching, and I'm content to give the bull manaics the better part of today.. 2pm.. lets see where we are then. From a pure MACD (blue bar histogram) cyclical perspective, we're set for a bullish cross by midday, and that would bode for at least another hour or so higher this afternoon. The earnings continue to come in... revenue misses remain an issue for many. No doubt, many of the EPS beats are via all sorts of 'accounting tricks'. Good work if you can get it. TWTR, -1%.. ahead of earnings. Another fail.. with a loss of the big $30 threshold looks probable. After all, it can't make any money. Good morning. Futures are moderately higher, sp +14pts, we're set to open at 2081. 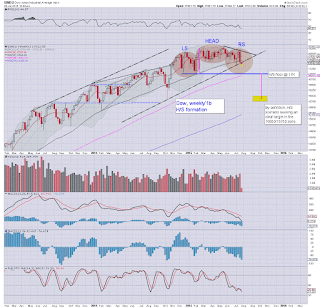 The bigger weekly cycles continue to suggest broader weakness to the Dow 17k threshold. 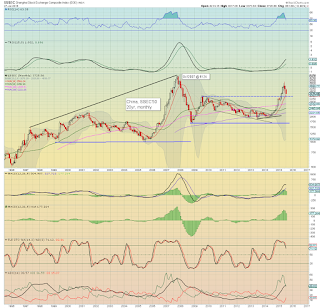 The USD is bouncing, +0.4% in the DXY 96.90s. Metals remain weak, Gold -$2, whilst Oil is +0.2%. So... we're set to open higher, and now its a case of whether the gains fail right from the open, level out by 11am, or can build across Wed/Thursday. Best guess... equity gains to max out by 11am. 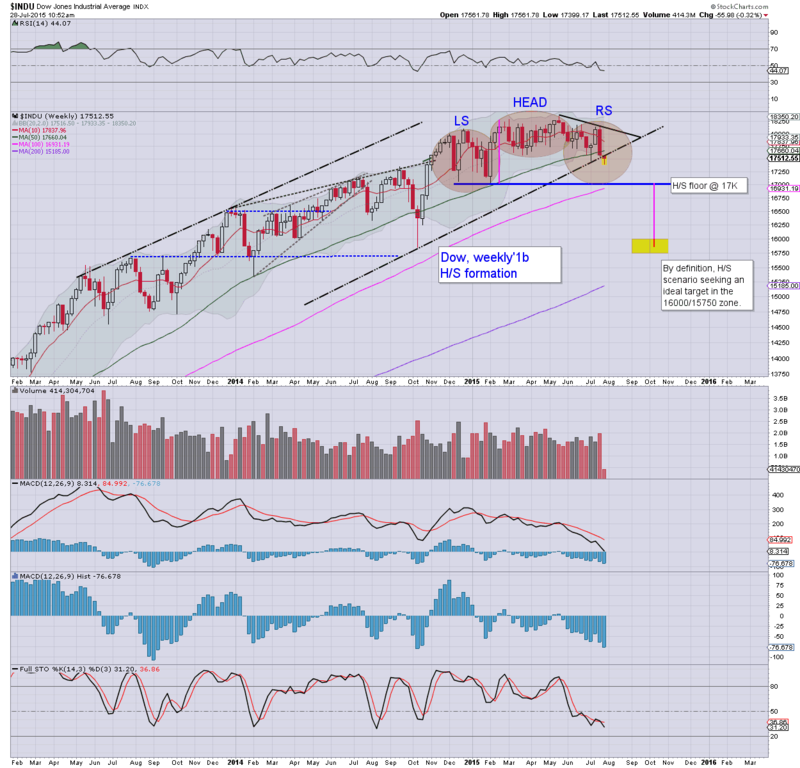 With the recent technical breaks - not least on the Dow, I find it hard to imagine new index highs in August. Daily/weekly cycles remain suggestive of further weakness, to Dow 17k, sp'2000, along with VIX in the low 20s.. within the 'immediate term'. *I will strongly consider picking back up a VIX-long in the 14s... having dropped from 16.10. On any basis... long VIX from the low teens seems very reasonable considering the recent price action. Overnight China action: broadly weak, despite a serious attempt by the China leadership to 'inspire' the buyers and threaten anyone who even considers selling. 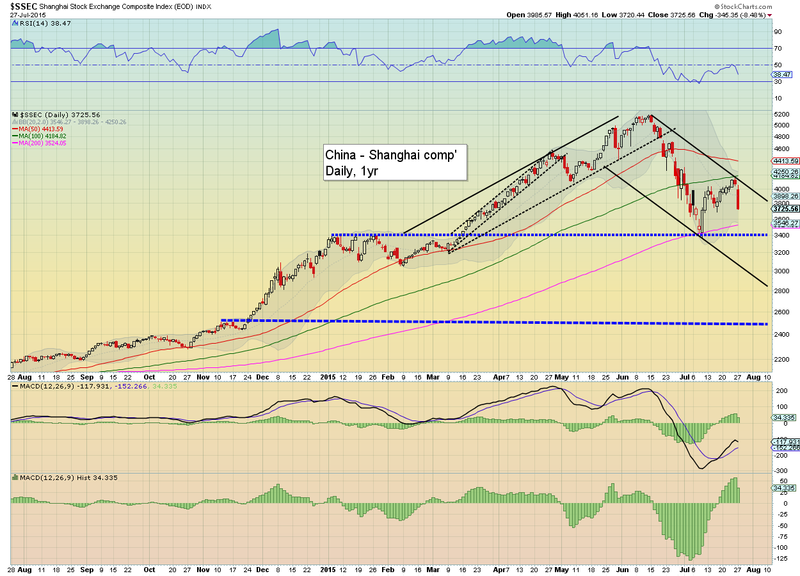 The Shanghai comp' settled -1.7% @ 3663. *awaiting an array of econ-data this morning, although clearly, the big one remains Q2 GDP.. due Thursday. TWTR have earnings at the close of today, unless they accidently release them in the closing hour instead. 8.37am.. sp +12pts.. 2079..... sustained action >2090 looks very difficult. I will have eyes on the VIX around 11am. 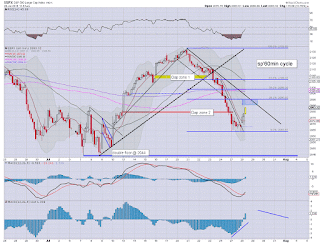 9.40am.. No hurry on the next short trade.... sp'2085/90 zone looks viable... before resuming lower. Who wants to buy the China dip? The bounce from 3373 is almost certainly complete, having maxed out at 4184. 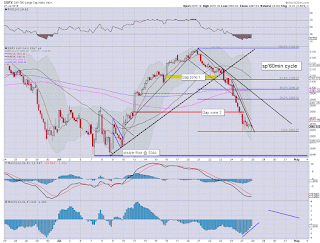 The Monday decline of -8.5% @ 3725 has naturally spooked many. Not surprisingly, the Chinese leadership are now suggesting all those in the trading community to refer anyone who dares 'maliciously sell/short' the market to 'the authorities'. 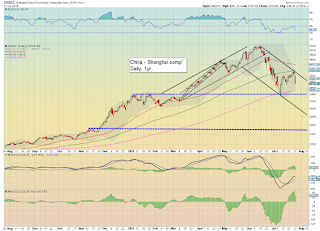 The Chinese drama continues, with a starkly bearish Monday decline. All manner of reasons are being attributed to the fall, but regardless of whichever one you prefer, price action sure isn't bullish. Downside to 3200/3000 zone looks a given.. the only issue is whether 2500... and considering a time window into early October... the latter looks easily viable. Tuesday will see the FOMC meeting begin. 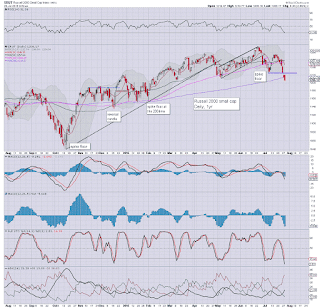 A fifth day lower for most US indexes, and with some key technical breaks on the bigger weekly/monthly cycles, the US market looks increasingly vulnerable.